Problem C1: Consider the two springs shown below. 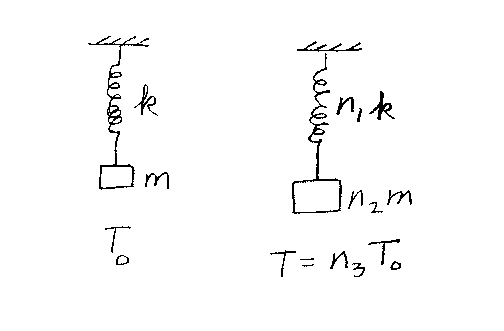 The spring on the left has a spring constant k with an object of mass m hanging at the end. The period of this mass-spring setup is T0. The spring on the right has a spring constant of n1k and an object of mass n2m hanging at the end. If the period of this spring is T = n3T0, what is n3? Note that all integers are unitless.